A couple of years ago at a family reunion, Uncle Bxx got wind of my interest in UFOs, and informed me that he had flown training missions at Nellis Air Force Range in Nevada from 1950 to 1952. This was huge news to me, because Nellis is the site of the Air Force's notorious, ultra-secret facility, Area 51. Do I need to explain what Area 51 is? Didn't think so. Anyway, Uncle Bxx told me in no uncertain terms that in all the target training exercises he had flown over Area 51, he never once saw a UFO. There was one time, he said, when some of his crew mates got excited by the sight of a bright glowing object just over the horizon, and started to wonder if it was a UFO. Uncle Bxx killed that party real fast, telling his pals that they were looking at the planet Venus, which was bright enough then to be visible during the day. When I asked my Uncle whether the Government had told him not to talk about what he had seen at Area 51, there was no cracking. Instead, I got a cold, stony silence. I was almost expecting his name, rank and serial number. After 60 years, the man was not about to change his story. Still, I persisted, and asked him more about his experiences at Nellis, and from what he told me, it's no wonder he never saw anything unusual. He must have been too terrified for his life to be looking for unearthly phenomenon. His job was to ride in the back of a target plane over the Nevada desert, and unfurl a giant target on a tow rope behind the plane. 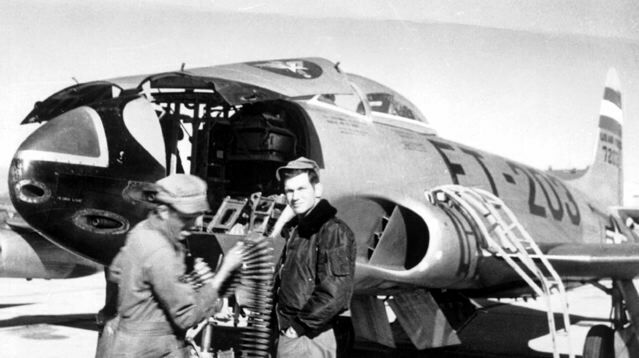 Once the target was unfurled, fighter pilot trainees -- and the key word here is "trainees" -- would make runs at the target and open fire at it with their machine guns using live ammunition. My cousin's husband, Sxxxx, listening in on the conversation, looked at me, dumbfounded, and said, "You couldn't make that tow rope long enough to get me on that plane!" Not enough danger for you? How about this. When they weren't getting shot at at 20,000 feet with live ammunition, my uncle and his crew "got the day off" to watch the Air Force drop atomic bombs at the Nevada Nuclear Test Site, at a comfortable distance of 20 whole miles. Yeah, men were men back then. So, no blockbuster UFO revelations from Uncle Bxx about his two years at Area 51. But plenty of wonderful memories from a really great guy... That's him looking all Steve McQueen in the leather flight jacket below.